Updated March 2019 - new pictures to come soon! 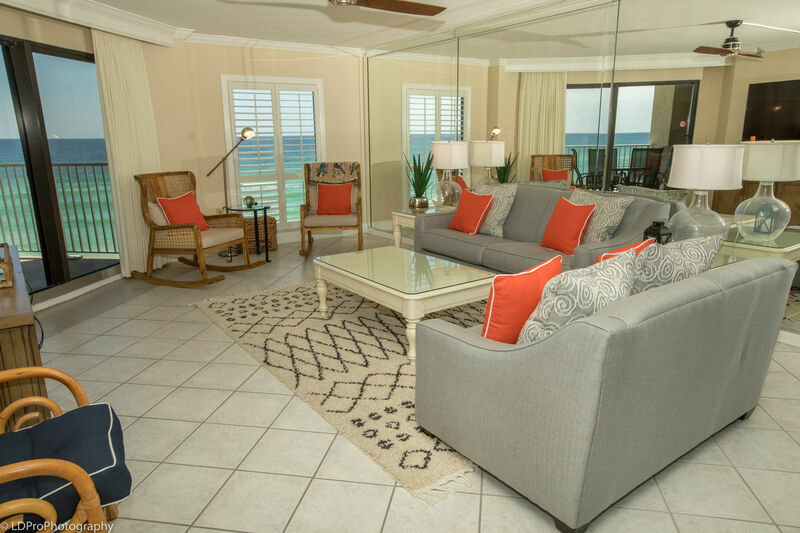 Take a peek at this amazing two bedroom, two bathroom beachfront Inlet Reef condo that sleeps 8, room 406. The huge Kitchen has a plethora of granite counter space and all the full size appliances, pots, pans, dishware, and silverware needed to prepare your favorite meal. The Dining Area has a large table that seats six, while there is an additional table adjacent to the Kitchen that seats two, as well as bar seating in the kitchen for two. The Living Room comes with a flat screen HDTV, a DVD player, a Love Seat, two plush chairs, a couch that doubles as a Queen Sofa Sleeper, and balcony access. The Master Bedroom has a King Bed, balcony access, and a wall mounted flat screen HDTV. The Master bathroom has a separate makeup area with its own sink, an additional sink, and a walk in shower. The Guest Bedroom has two sets of twin bunkbeds and a wall mounted flat screen HDTV. The Guest Bathroom has a granite encased sink and a bathtub/shower combination. The balcony is hexagonal in shape, comes with a wet bar, and an outside dining table. The view from the balcony is truly a sight to behold. From the emerald green waters of the Gulf of Mexico, to the powder white sands of Destin’s Beach, the view has to be seen to be believed. Complex amenities include grills, tennis courts, a swimming pool, exercise room, and Men & Women's Saunas. This is a great condo! This is our 5th trip to Destin, and we’ve stayed at Inlet Reef every time, but this is the best condo we’ve been in so far. The view of the gulf is great as with any gulf front condo, but this one has had some renovations that makes it a step above some of the others. It really adds to the vacation experience to have a “home” atmosphere rather than a tired rental. We really appreciate the owners allowing us to rent such an awesome place and we promise to leave it as well as we found it. The condo was beautiful. Awesome view, clean, and adequately stocked. The only issue was that we could not get the wifi to work even after calling for assistance. However, it was nice to disconnect for a few days. We enjoyed our stay. The room was incredible with great amenities. The beach guy (Will) was very professional. We will be back! Next time we ask that you provide sunny skies throughout!